Neanderthals may have survived in Europe much longer than previously thought. 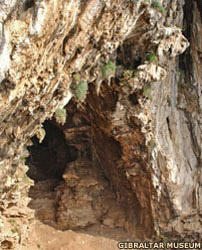 A study in Nature magazine in 2006 suggested the species may have lived in Gorham's Cave on Gibraltar up to 24,000 years ago. Neanderthals (Homo neanderthalensis) were previously believed to have died out about 29,000 years ago, at a time when modern humans were advancing across Europe. 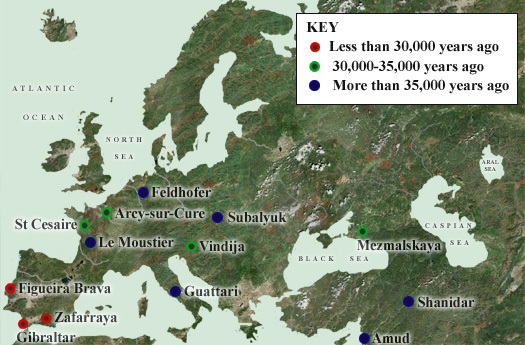 The 2006 evidence showed that they held on in Europe's far south long after the arrival of Homo sapiens. 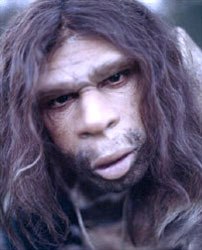 The research team believed that the Gibraltar Neanderthals may even have been the very last of their kind. Their study showed conclusively that Gorham's Cave was the last place on the planet in which Neanderthals were known to have lived. The study was lead by Professor Clive Finlayson, director of heritage at the Gibraltar Museum. Once thought to have been the ancestors of modern humans, the Neanderthals were eventually proven to be cousins, with both they and Homo sapiens evolving from the same species of human, Homo Heidelbergensis. They appear in the fossil record around 300,000-400,000 years ago and, at their peak, these squat, physically powerful hunters dominated a wide range, spanning Britain and Iberia in the west to Israel in the south and Uzbekistan in the east. 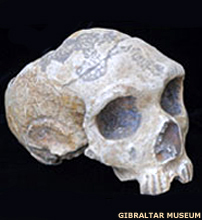 Homo sapiens evolved in Africa from about 200,000 years ago. They displaced the Neanderthals in the Middle East and then again after entering Europe about 40,000 years ago. Researchers from Britain, Gibraltar, Spain, and Japan obtained radiocarbon dates on charcoal from ancient hearths which had been unearthed deep inside Gorham's Cave on Gibraltar. The charcoal came from soil layers in the cave from which archaeologists had previously unearthed stone tools of a type made exclusively by Neanderthals. The earliest samples of charcoal were dated to 33,000 years ago, while the youngest were dated to 24,000 years ago - a much more recent date than anyone could have imagined. But evidence for a presence 24,000 years ago was limited, so the researchers could only say with confidence that Neanderthals were in the cave until 28,000 years ago. Even so, this date made the cave the most-recent Neanderthal occupation site known anywhere. Scientists believed it was a favoured spot, one in which hunting groups sought refuge from ; cold weather during the last ice age. The rock shelter is well ventilated and relatively well illuminated; a high, vaulted roof meant that smoke from the Neanderthals' fires would have risen away from the cave floor, instead of lingering at ground level and choking the occupants. And because sea levels were lower at this time, Gibraltar was surrounded by a coastal plain rather than water. Covered by marshes in some places and in others by sand dunes, the plains were a habitat for a rich array of animals. The rock (Gibraltar's modern nickname) would have made for a good vantage point for Neanderthal hunters: excellent for anyone trying to map their resources and decide where the next meal may be coming from. On top of the rock, there may have been fauna such as ibex; out on the plains there would have been deer, and possibly horses and rabbits. They were also eating shellfish and even tortoises - the poor things were probably being baked in their shells. The site provided important insight into the reasons for Neanderthal extinction. For years, experts tended to look for one single reason for Neanderthals dying out - whether it be modern humans interbreeding with them, or out-competing them, or killing them off. The Gibraltar evidence fitted into a picture which had been emerging in more recent years of quite a complex event. The idea of modern humans coming in and Neanderthals dying out simply didn't happen. One view of Neanderthal extinction had them rapidly vanishing as modern humans swept across Europe. Modern man was a suspect, but the new evidence supported an important role for climate change. The Neanderthals survived in local pockets during previous ice ages, bouncing back when conditions improved. But the last one appears to have been characterised by several rapid and severe changes in climate which hit a peak 30,000 years ago. These were probably more dramatic in more northerly parts of Europe, where they may have upset the balance between Neanderthals and modern humans, allowing moderns to gain the upper hand. 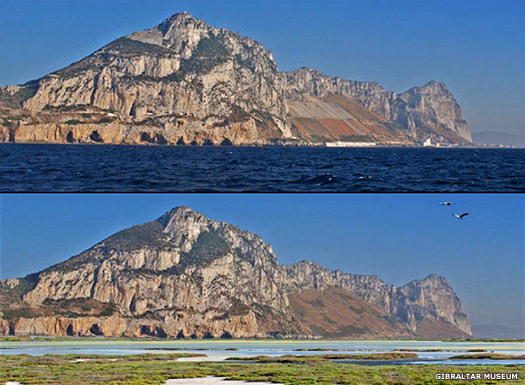 Gibraltar's climate was sheltered from many of these changes, but it did eventually deteriorate. Deep-sea core data from the early 2000s showed that temperatures dropped sharply around 24,000 years ago. This could have created drought-like conditions in the area which may also have reduced the number of prey the Neanderthals could catch. If a shrinking Neanderthal population was already on the edge of extinction, this may have been just enough to tip them over.